Church History - ST. PAUL LUTHERAN CHURCH Share God's Love; Serve all People 32 9 E State Street, Mason City, IA 50401 641-423-7749 OFFICE HOURS: Monday through Friday 9 a.m. to 1 p.m.
﻿Saint Paul Lutheran Church was born on June 3, 1962 when the Mason City congregations of Central Lutheran Church and Immanuel Lutheran Church became one. All movable contents as could be used from Immanuel Lutheran Church were transferred to the Central Lutheran Church building. (This is the building we still use located at 329 East State Street.) The Wicks Memorial Pipe Organ from Immanuel Church was moved and installed in the chancel and was in use in December of 1962 and continues to serve our congregation. The Immanuel Church and parsonage were rented but eventually sold. ​Our church was built by the congregation of Central Lutheran Church. Central Church was organized in 1927. Their first services were held at the Chamber of Commerce rooms. This newly-formed congregation set about planning a building in which they could worship. The original plan was to construct the basement and then build the superstructure. According to this plan the basement was to serve as a foundation for the superstructure and at the same time the basement would give the congregation a home in which they could worship. Ground breaking was celebrated on October 14, 1927; the basement portion of the church was dedicated on March 25, 1928. “The years ahead were trying ones for the congregation. Due to the depression and higher interest rates the proposed building program suffered an arrested development. In spite of these discouragements the congregation pressed on, adding to its original membership other consecrated Christians who assisted in retiring the indebtedness of the Church basement. It was indeed a happy day in the history of the congregation when their record was wiped clean of all indebtedness. This occasion was celebrated at a formal service on February 1947. The church superstructure was dedicated on April 16, 1950. 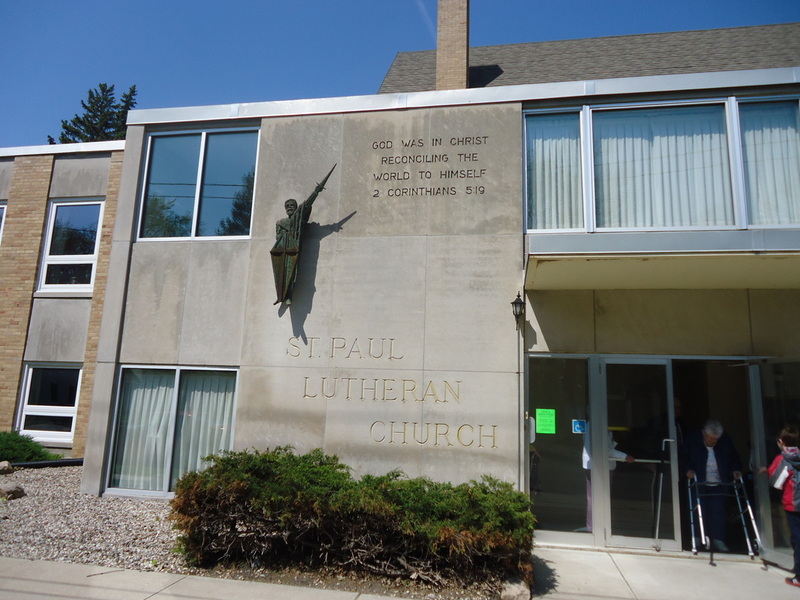 In June, 1962, the newly formed congregation of Saint Paul Lutheran Church voted to purchase the land adjoining the church on the south as the first step toward building the Educational Unit. Plans were made for the Educational Unit and redesigning the chancel area of the church to accommodate a free-standing altar with more kneeling area. The ground-breaking ceremony for the Educational Unit was September 6, 1964, and the dedication service was Sunday, May 16, 1965.